Guidebook to the 1250km of Spain's Sendero Historico (GR1), traversing northern Spain from Puerto de Tarna in the province of Leon in the west to the Mediterranean near L'Escala in Catalonia, through fascinating, varied landscapes and the foothills of the Pyrenees. Described in 53 stages, about 25km each in length, with detailed mapping. 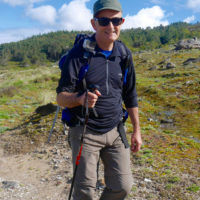 This guidebook is for trekkers aiming to tackle all or part of the GR1 or Sendero Historico – 1250km of waymarked route across northern Spain through the Pyrenean foothills from Puerto to Tarna at the western end to near L’Escala on the Mediterranean coast. 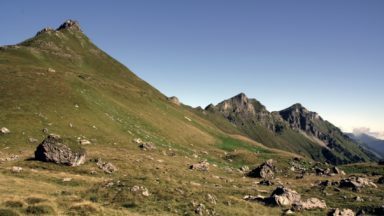 Broken into 7 sections and 53 stages, the walking goes through remote landscapes, but accommodation is accessible at the end of every day, and the terrain is not difficult. All sections are suitable for novice and experienced walkers alike. Providing all the information trekkers will need, the guide starts with a useful introduction combining practical information about planning your own itinerary, when to go, what to take and the accommodation, cuisine and terrain to expect along the way with general information about the varied geology and fascinating history of the provinces you will be walking through. Step-by-step route description is accompanied by custom-drawn, contoured mapping, vibrant photography and stage and section summary information to help you plan, as well as detailed information about the accommodation options available at the end of each day’s walking. Also included is information about how to get to Puerto de Tarna from the northern coast of Spain, if you want to make the GR1 into a true coast-to-coast. 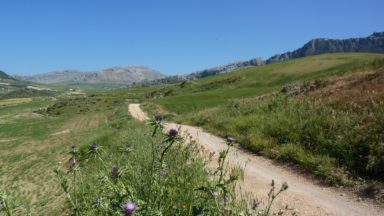 Walking through rural Spain is a unique experience and the GR1 meanders through some of the best scenery northern Spain has to offer. 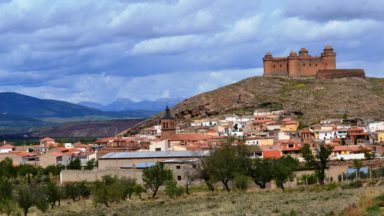 At the same time, the route visits many medieval churches and castles from the time of the Christian kingdoms, the reconquest, the crusades and Spanish Unification as well as key locations in the development of modern Spain. What’s more you’ll have long views of the changing landscapes all the way, as the mountains of Spain, unlike the rest of Europe, are not cloaked in pine forests. John Hayes is keeping update information for his book listed on his own blog. This is a well written guide to an attractive route and makes interesting reading. Recommended. Spain has a fine selection of long-distance paths, but this one is probably the finest. 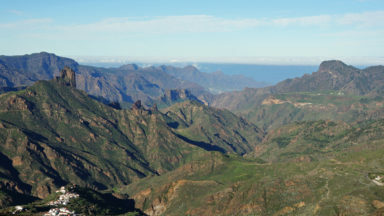 The walking is generally easy and full of interest with wide ranging views as the mountains are not covered with trees as some areas of similar altitude are. There is much of historical interest as the route roughly follows along the Medieval Moorish Christian frontier. 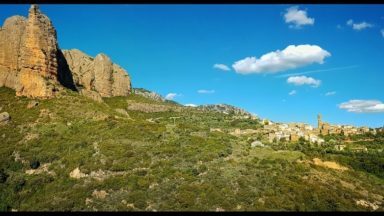 The GR1 falls short of being a coast to coast walk, but the author details a number of ways of extending the route using other Spanish long distance paths from the Atlantic coast to Puerto de Tarna, the start of GR1. Ken Baldwin, Managing Director, Totally Spain, www.totallyspain.com. "Guides/schmuides. In the digital age we live in, do we really need to reserve space in our luggage for a book? If the title in question's The GR1: Spain's Sendero Histórico, there's a case for making room. 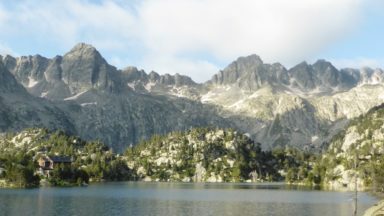 Hayes' [experience] allows him to compare landscapes. And so "the limestone landscape of the eastern Cantabrian Mountains" resembles "the Ardeche in France and includes some of the same distinct features including the deep gorges, natural bridges and underground caves." This is an author who much prefers to rely on first-hand experience as opposed to trawling through the World Wide Web. Easy to digest, The GR1: Spain's Sendero Histórico feels a short 294 pages. Whilst you could read it cover to cover as I did, it's of more use if you dip in and out of it. This is a book, after all, designed for those on the go. Matthew Hirtes, The Huffington Post. Stuffed full of fantastic and sunny photographs, the Sendero Historico guide for Cicerone is a great little guide to a super looking long distance trek.